What are the Basic Elements of a Fiber Optic Communication System? For gigabits and beyond gigabits transmission of data, the fiber optic communication is the ideal choice. This type of communication is used to transmit voice, video, telemetry and data over long distances and local area networks or computer networks. A fiber Optic Communication System uses light wave technology to transmit the data over a fiber by changing electronic signals into light. Some exceptional characteristic features of this type of communication system like large bandwidth, smaller diameter, light weight, long distance signal transmission, low attenuation, transmission security, and so on make this communication a major building block in any telecommunication infrastructure. The subsequent information on fiber optic communication system highlights its characteristic features, basic elements and other details. 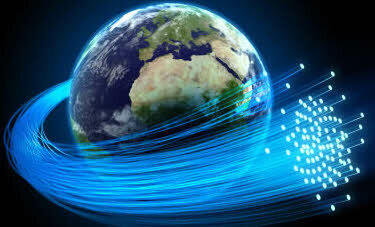 How a Fiber Optic Communication Works? Unlike copper wire based transmission where the transmission entirely depends on electrical signals passing through the cable, the fiber optics transmission involves transmission of signals in the form of light from one point to the other. 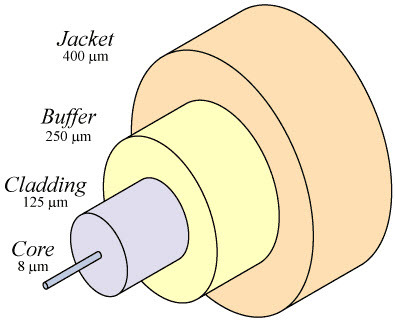 Furthermore, a fiber optic communication network consists of transmitting and receiving circuitry, a light source and detector devices like the ones shown in the figure. When the input data, in the form of electrical signals, is given to the transmitter circuitry, it converts them into light signal with the help of a light source. This source is of LED whose amplitude, frequency and phases must remain stable and free from fluctuation in order to have efficient transmission. The light beam from the source is carried by a fiber optic cable to the destination circuitry wherein the information is transmitted back to the electrical signal by a receiver circuit. The Receiver circuit consists of a photo detector along with an appropriate electronic circuit, which is capable of measuring magnitude, frequency and phase of the optic field. This type of communication uses the wave lengths near to the infrared band that are just above the visible range. Both LED and Laser can be used as light sources based on the application. Accessories like connectors, switches, couplers, multiplexing devices, amplifiers and splices are also essential elements in this communication system. Depending on the applications like local area networks and the long haul communication systems, the light source requirements vary. The requirements of the sources include power, speed, spectral line width, noise, ruggedness, cost, temperature, and so on. Two components are used as light sources: light emitting diodes (LED’s) and laser diodes. The light emitting diodes are used for short distances and low data rate applications due to their low bandwidth and power capabilities. Two such LEDs structures include Surface and Edge Emitting Systems. The surface emitting diodes are simple in design and are reliable, but due to its broader line width and modulation frequency limitation edge emitting diode are mostly used. Edge emitting diodes have high power and narrower line width capabilities. For longer distances and high data rate transmission, Laser Diodes are preferred due to its high power, high speed and narrower spectral line width characteristics. But these are inherently non-linear and more sensitive to temperature variations. Nowadays many improvements and advancements have made these sources more reliable. A few of such comparisons of these two sources are given below. Both these sources are modulated using either direct or external modulation techniques. Optical fiber is a cable, which is also known as cylindrical dielectric waveguide made of low loss material. An optical fiber also considers the parameters like the environment in which it is operating, the tensile strength, durability and rigidity. The Fiber optic cable is made of high quality extruded glass (si) or plastic, and it is flexible. The diameter of the fiber optic cable is in between 0.25 to 0.5mm (slightly thicker than a human hair). A Fiber Optic Cable consists of four parts. The core of a fiber cable is a cylinder of plastic that runs all along the fiber cable’s length, and offers protection by cladding. The diameter of the core depends on the application used. Due to internal reflection, the light travelling within the core reflects from the core, the cladding boundary. The core cross section needs to be a circular one for most of the applications. Cladding is an outer optical material that protects the core. The main function of the cladding is that it reflects the light back into the core. When light enters through the core (dense material) into the cladding(less dense material), it changes its angle, and then reflects back to the core. The main function of the buffer is to protect the fiber from damage and thousands of optical fibers arranged in hundreds of optical cables. These bundles are protected by the cable’s outer covering that is called jacket. Fiber optic cable’s jackets are available in different colors that can easily make us recognize the exact color of the cable we are dealing with. The color yellow clearly signifies a single mode cable, and orange color indicates multimode. Single-Mode Fibers: Single mode fibers are used to transmit one signal per fiber; these fibers are used in telephone and television sets. Single mode fibers have small cores. Multi-Mode Fibers: Multimode fibers are used to transmit many signals per fiber; these signals are used in computer and local area networks that have larger cores. The purpose of photo detectors is to convert the light signal back to an electrical signal. Two types of photo detectors are mainly used for optical receiver in optical communication system: PN photo diode and avalanche photo diode. Depending on the application’s wavelengths, the material composition of these devices vary. These materials include silicon, germanium, InGaAs, etc. This is all about the basic elements of the fiber optic communication system. For additional information, and for any kind of assistance, please write to us as we encourage and appreciate your suggestions, feedback, queries and comments. Please share your ideas, suggestions and comments in the comment section given below. ‹ Previous Why You Should Start Academic Projects from Engineering 1st Year? This is very in understandable language. Thanks a lot.. .. Thank you so much for your feedback. As per your query, The main part of a photodiode is a reverse-biased pn junction that can be illuminated. In the dark the reverse current through the device is small. When the diode is illuminated an additional reverse current dependent on the incident optical power appears. Whereas, The reverse biased pn junction photodiode operates in the photoconductive mode. If the illuminated diode is used without external bias, a measurable forward voltage appears between the p and n regions. This is called photovoltaic effect. It is really very easy to understand method. thanks a lot for your kind efforts. 1 more think please express the types of OFC and photo detector details briefly like u hv explain in LED or LASER. Means where PN photo diode required and where avalanche photo diode is used as per their works in OFC. Ur welcome sir…ya ofcourse i will visit to ur website?? GREAT ARTICLES . SO INTRESTING TO READ AND SO HELPFUL TO MY STUDIES .IF POSSIBLE I NEED PAST EXAMINATION QUESTIONS PAPERS THROUGH MY EMAIL . Great article……..to the point and precise. Generates interest of further reading in the topic. Thank you for posting such an amazing article. And also,let we know the exactly for what you were looking for.